Planning commissioners will discuss an appeal from historical preservationists during a June 13 hearing. Call it a one-stop shop for all of your development needs. Golba Architecture not only designs residential and commercial building projects, but its principal, San Diego Planning Commissioner Tim Golba, is qualified to provide a historical analysis on the property. Of course, this could be pretty useful in steering clients through the City's permitting process. These services are what Golba and his firm provided for Jack and Karen Visin, owner of two 90-year-old cottages located at 341 and 337 Playa del Sur in La Jolla, just steps from the popular Windansea surf break. The property owners have commissioned Golba Architecture to oversee the demolition of two beach cottages to make room for a 3,273 duplex. Residents want to put a stop to that, at least until the City's Historical Resources Board can conduct a thorough review on the buildings and their historical significance. They say the historical analysis, conducted by attorney Scott Moomjian and Golba, was inadequate and tilted in favor of their clients. They accuse Golba of donning one too many hats in the process. On June 13, the group of residents and members of Save Our Heritage Organisation will urge San Diego's Planning Commissioners to vote in favor of their appeal and against the project manager's recommendation. Tudor and vernacular style cottages like those found on the Visin's property, were a common sight in the mid-to-late 1920's in La Jolla. So it's easy to assume the cottages have quite the story to tell. Not so, determined historical analyst Scott Moomijian in a November 2010 report. "Historical research indicates that the Property is not historically and/or architecturally significant. The buildings were not associated with any important events or individuals at the local, state or national levels; do not embody the distinctive characteristics of a style, type, period, or method of construction; and do not represent the notable work of a “master," reads the Historical Resource Technical Report he filed in 2010. For his report, Moomijian used information that Golba compiled after conducting a forensic analysis of the property, commissioned by the property owners. "To follow up on our site investigation on the above referenced property, please let the record reflect that per the request of Jack and Karen Visin, our office conducted a site forensic investigation on October 7, 2010. This extensive site investigation/inspection of the above referenced property was conducted with yourself [Moomjian] and the property owner, Ms. Karen Visin. The purpose of this site visit was to gather physical data in order to prepare this forensic analysis letter as a response to comments/questions which were raised by City of San Diego, Plan- Historic Staff in conjunction with the Preliminary Review application for the Property." After the report was submitted, the City gave the property owners, and Golba Architecture, the green light to begin demolishing the two buildings. "One big problem is the lack of transparency in the process," writes La Jolla resident Donna Blackmond. "The historical evaluation should not be carried out by a party with a financial interest in the outcome. When the community process is circumvented in a democratic society, we all lose." It's not the first time that San Diego's Development Services Department has been criticized for the historical review process. “Development Services did not ensure that the property owners’ or applicants’ general applications contained accurate and complete information for it to assess whether potential historical resources exist on their respective project sites," read an April report from California's State Auditor. Blackmond and others are using the recent audit to support their claims. "[The audit] pointed out that the City typically relies on permit applicants to provide historical information about properties for which they are requesting permits for alterations or demolitions, which brings in the potential for conflict of interest. The conclusion is that we need to take greater care to insure that accurate and complete information is presented, in an independent manner, in cases where historical designation is at stake." But Golba defends the process and denies any conflict of interest. He says the forensic analysis he conducted occurred before his firm was hired to design the new duplex. "Attorney Scott Moomjian was retained by the owners to research the structures, provide a report and process the preliminary review through the City to establish if there was any historical significance to the homes," wrote Golba in a June 9 email. "My firm only consulted to Moomjian in terms of forensic investigation...we have not rendered an opinion on the issue of the historicity of the building. We only provided forensic consulting. Further, the issue of historical significance at the City is handled either by staff of the Historical Resources Division or the Historical Resources Board. The Planning Commission is neither qualified to make that type of determination nor empowered to do so." As for his role during Thursday's hearing, there will be none. Golba says he will recuse himself. "The records will reflect that I have not presented this project to any planning group, had direct design work on it or had involvement in the design and discretionary permit that was approved by staff." Yet, despite that, opponents vow to fight the development until further review can be done. The tide seems to be turning in their favor. Blackmond says the project manager for the City, Jeff Peterson, has changed his recommendation after representatives from Save Our Heritage Organisation met with Mayor Filner last week. The Planning Commission will discuss the item at 9am on Thursday. HonestGovernment June 10, 2013 @ 9:33 a.m. Excellent report. This picture shows a beautiful relic of the past, in good shape and with excellent stonework, shingles, and windows. It sits among a bunch of nondescript multiunit boxes, hinting at a quieter, less crowded San Diego-by-the-sea that no longer exists. Its charm adds more value to the neighborhood than anything that the owners could build in its place. It's amazing that the most nondescript houses in North Park, South Park, Talmadge, Kensington, Mission Hills, etc., are routinely given Mills Act tax exemptions, relying on the most obscure former owner's purported historic status or some element seen in most of the houses throughout the older neighborhoods, yet this beautiful old beach bungalow is dismissed as having no significance. It's a good time to recall the demolished Carnegie Library, a lovely building that was replaced in 1964 by the present old library downtown. San Diego lacks the ambiance and character of many California towns because of a determination to tear down its history. 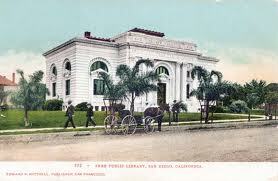 Carnegie Library, designed in 1902, by New York architects Ackerman and Ross. William Hebbard and Irving Gill were subcontracted as construction superintendents. DavidnPB June 10, 2013 @ 10:48 a.m.
Clear conflict of interest, and the "Report" was a total sham effort. Golba MUST recuse himself; better yet, resign. Visduh June 10, 2013 @ 3:10 p.m.
What a cool looking cottage. If LJ real estate were not valued so crazily, someone would buy and cherish that old gem. But this is La Jolla and in La Jolla everything is expensive and that piece of land can bring millions. Millions, really? Absolutely. Dorian Hargrove June 10, 2013 @ 3:19 p.m.
Visduh June 10, 2013 @ 4:46 p.m.
OK, maybe not millions, but a million at today's soaring home prices. And property in LJ and in Coronado never seems to decline in price. HonestGovernment June 10, 2013 @ 8:54 p.m. In a La Jolla Light article on May, 2013, it is reported that during a meeting of the La Jolla Community Planning Association, "the property owner, Karen Visin, said the city denied the historic designation in 2010, and that she believes the time to appeal that decision and the environmental determination has passed." If the Visins applied for historic designation after they bought the cottages in 2009, and were denied, perhaps the tear-down is their way of sort of forcing the issue. I've known other buyers to make the same threat: designation or tear-down. The beach cottages were previously assessed at $170K, from a 1984 purchase. It the Visins could get a historic designation, and a Mills Act exemption, then their investment would cost them much less than the current taxes of $9500. If they can't get that kind of tax break, it makes cold-hearted economic sense to turn the two very small cottages into a larger income-producing property. Even though the cottages have no famous owner/builder/architect names attached to their history, and don't deserve a tax break because of that, it is sad to see them turned into a financial hedge. They deserve saving on their own merit. Hardcover July 15, 2013 @ 7:34 p.m.
HonestGovernment: The report was prepared by the same guy that was going to get the job of building the new structure if it was not declared historic, so why would he say it's historic? And, you should know, there are 2 types of "historians" in town: the type that you ask if a building is historic who says "let me do a bit of preliminary research and get back to you on that" and the type who says "I don't know, do you WANT it to be historic?"